On this day in 1918, Lieutenant Wallace Lloyd Algie was killed in action northeast of Cambrai, France. His actions on that day would lead to his posthumous award of the Victoria Cross. Wallace Lloyd Algie was born on June 10, 1891, in Alton, Ontario, the son of James and Rachel Algie of Toronto. He graduated from the Royal Military College of Canada and volunteered in the active militia with the Queen’s Own Rifles of Canada and the 40th Regiment, serving as a lieutenant. 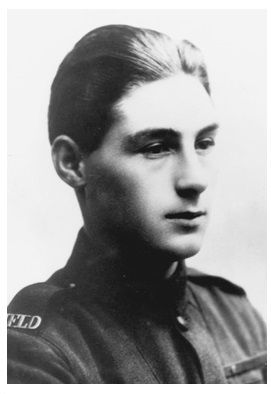 Algie was a bank clerk in Toronto before enlisting as an officer in the Canadian Expeditionary Force (CEF) on April 19, 1916. He sailed on the SS Laconia on September 25, 1916, and was attached to the 95th Battalion upon arrival at Seaford, England. He proceeded to the European theatre with the 20th Canadian Infantry Battalion on May 26, 1917. He completed various officer training courses, including one on the Lewis Gun. Lieutenant Wallace Lloyd Algie is buried in Niagara Cemetery, Iwuy, France. 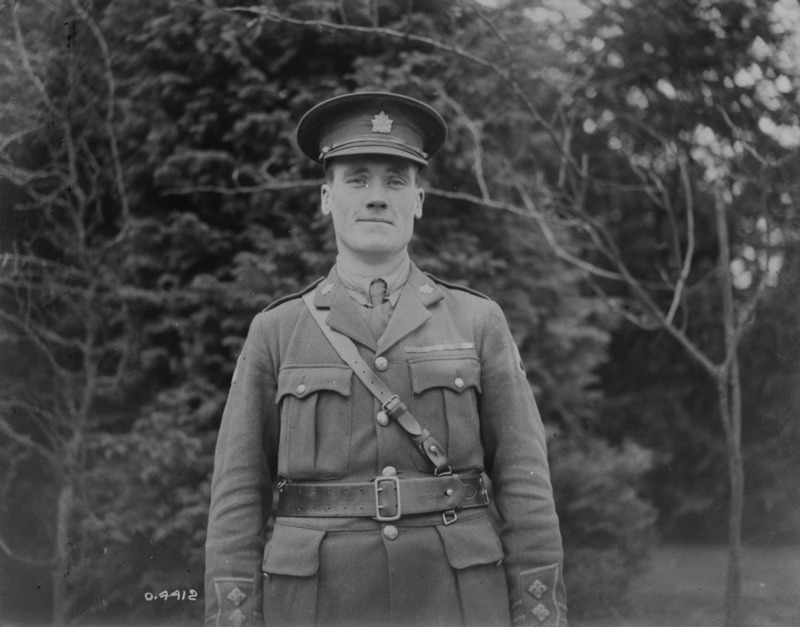 Library and Archives Canada holds the CEF service file for Lieutenant Wallace Lloyd Algie. Emily Monks-Leeson is an archivist in the Digital Operations and Preservation Branch at Library and Archives Canada. 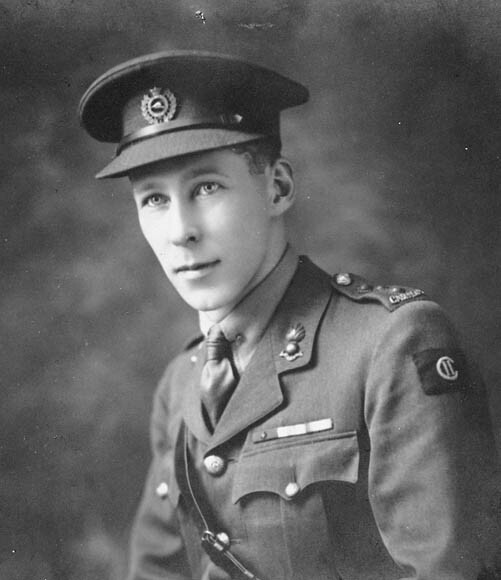 In Library and Archives Canada’s Victoria Cross blog series, we profile Canada’s Victoria Cross recipients on the 100th anniversary of the day they performed heroically in battle, for which they were awarded the Victoria Cross. 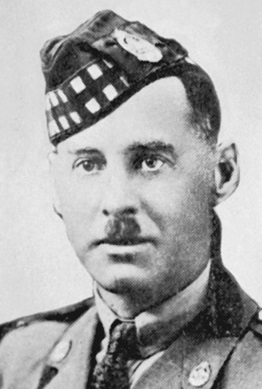 Today, we remember Captain Coulson Norman Mitchell and his courageous acts at the Canal de l’Escaut, France, from October 8 to 9, 1918. 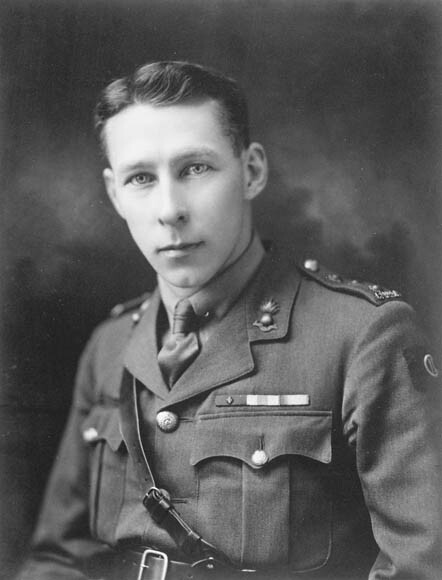 Born in Winnipeg, Manitoba, on December 11, 1889, Mitchell was a civil engineer before enlisting as a private with the Canadian Railway Construction Corps on January 21, 1915. In 1916, he became a lieutenant and joined the 1st Tunneling Company, Canadian Engineers. 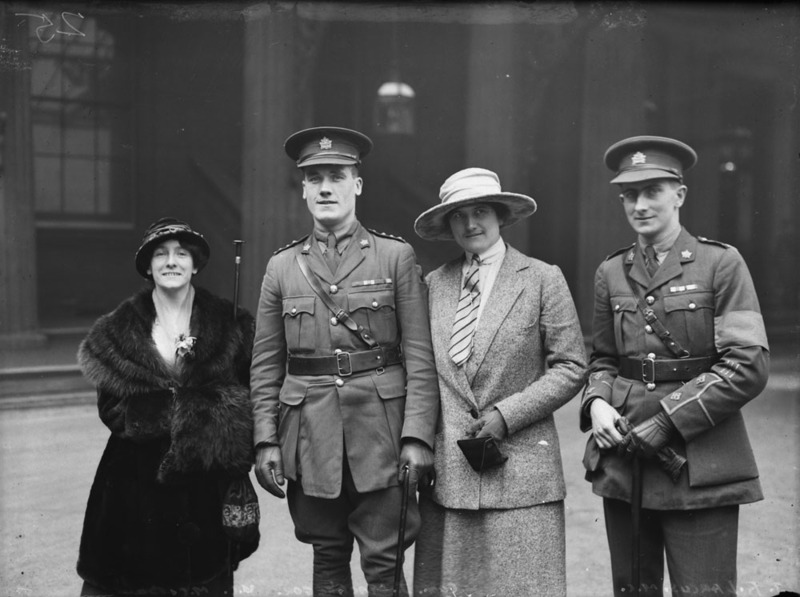 Mitchell was promoted to captain in 1917 after receiving the Military Cross for his gallantry. In 1918, Mitchell was posted to the 4th Battalion, Canadian Engineers. During his time with the 4th Battalion, he performed a heroic feat that helped to ensure Allied success at the Canal de l’Escaut, northeast of Cambrai, France. 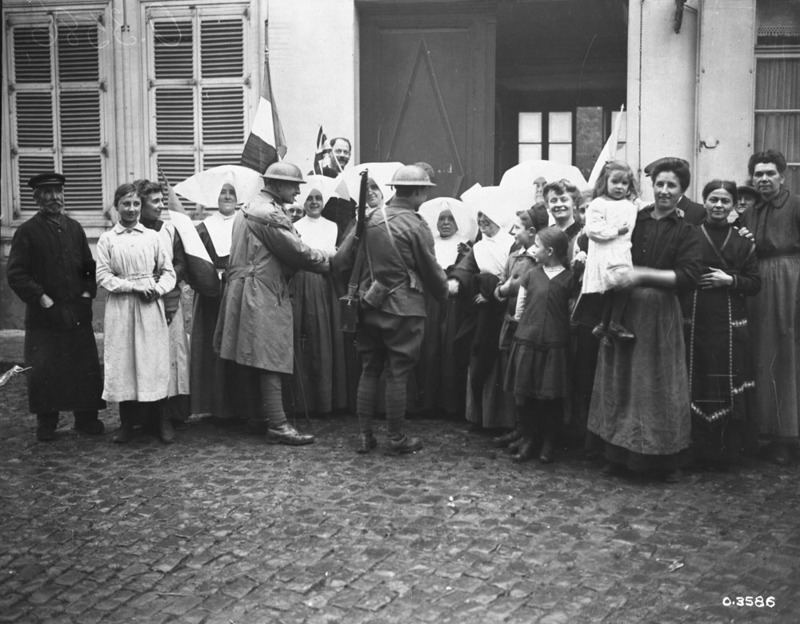 After the end of the Battle of Canal du Nord on October 1, 1918, Allied soldiers were intent on entering and clearing the town of Cambrai. 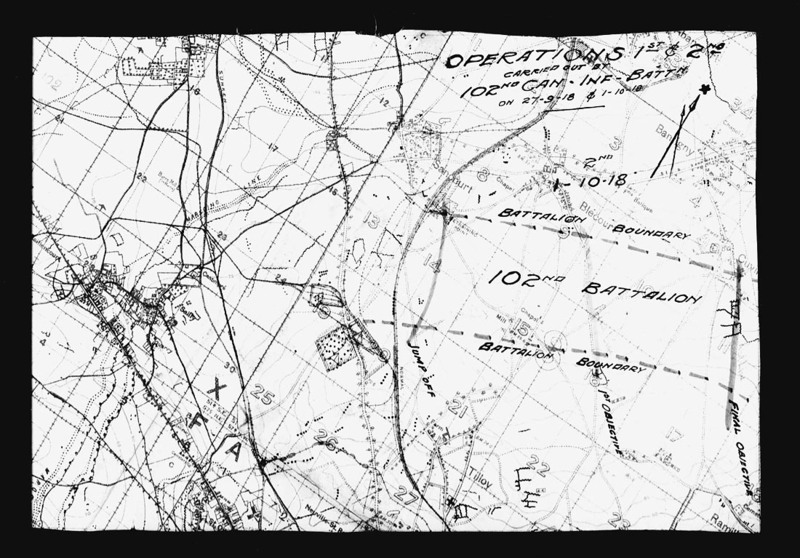 Previous offensives had opened some roads into the town, and now a further manoeuvre was needed to bring in the 3rd Canadian Infantry Division. 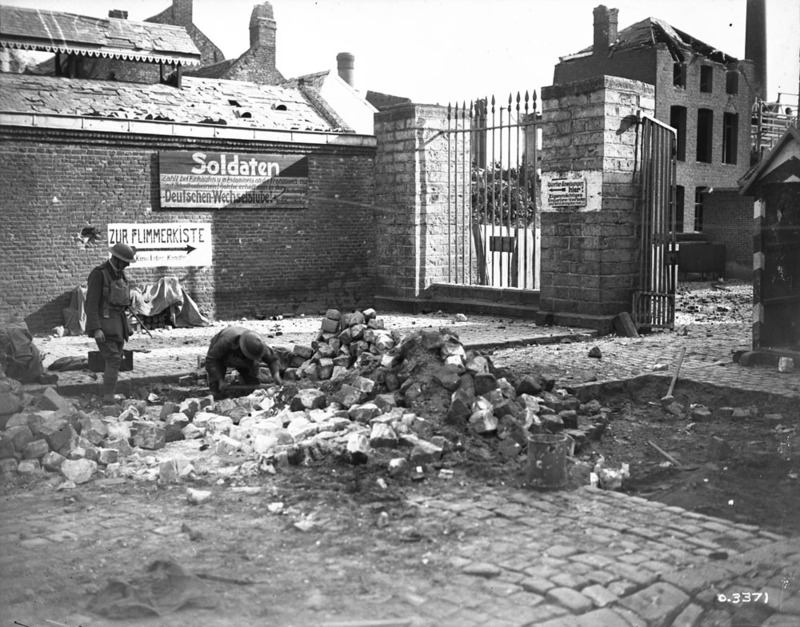 German resistance was strong to the northeast of Cambrai, and the Canadians aimed to capture and move beyond the town. The following days would see a Canadian offensive, with Canadian forces liberating French villages against stubborn German resistance. On the night of October 8 to 9, 1918, Mitchell led a party of sappers (soldiers responsible for building and repairing roads and bridges, and clearing mines) on a reconnaissance mission near Cambrai. Their task was to go beyond the security of the Canadian front lines to inspect bridges over which the Canadian 5th Infantry Brigade planned to advance. The goal was to prevent these bridges from being demolished. 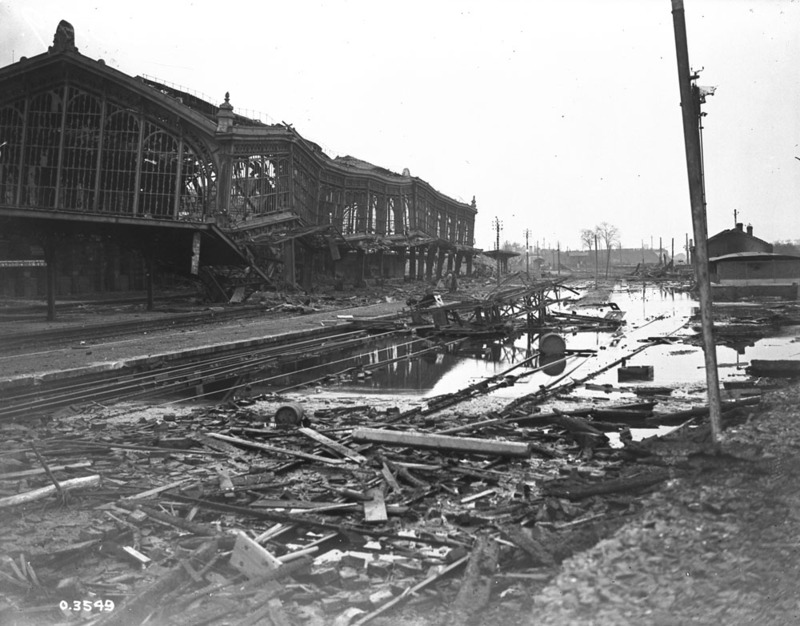 After coming across one bridge that had been destroyed, Mitchell and his team moved on to the next bridge, which stretched across the Canal de l’Escaut. Under heavy barrage and in total darkness, Mitchell ran across the bridge, unaware of the enemy’s positions or strength. He discovered that the Germans had prepared it for demolition. With the assistance of a non-commissioned officer, he cut the detonation wires and removed the explosive charge. 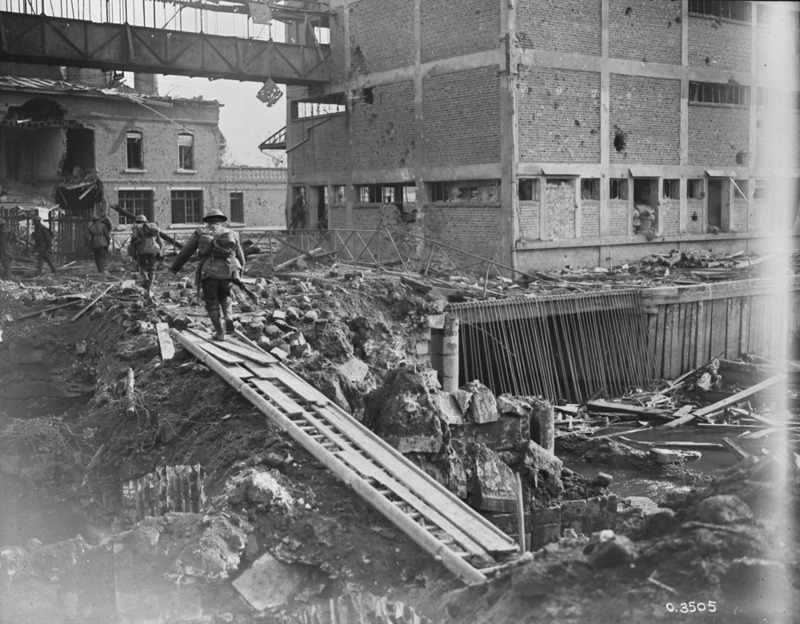 When the Germans realized that their explosives were being removed, they moved toward the bridge to set off the detonations. Seeing that his sentry was wounded, Mitchell rushed forward to assist. He killed three German soldiers and took 12 prisoners. Saving the bridge helped to assure the later success of the 5th Infantry Brigade’s operations. Then under heavy fire he continued his task of cutting wires and removing charges, which he well knew might at any moment have been fired by the enemy. It was entirely due to his valour and decisive action that this important bridge across the canal was saved from destruction. London Gazette, no. 31155, January 31, 1919, pp. 1503. 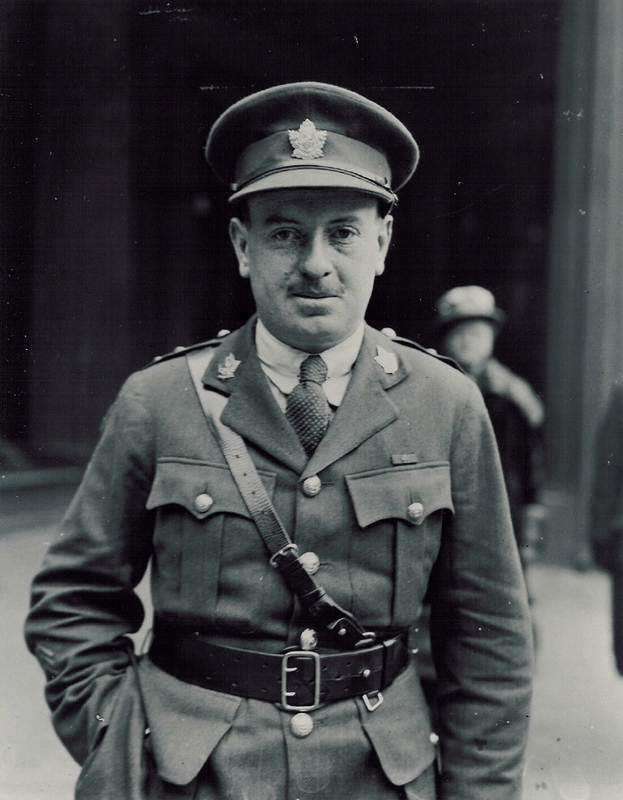 Mitchell served in the Canadian Engineers until April 28, 1919, when he left during general demobilization. He returned to Canada after the war and resumed his career as a civil engineer. During the Second World War, he commanded engineering units in Britain. In 1943, he returned to Canada as a lieutenant-colonel in charge of an engineering training centre. After the war, he returned to his civilian career once again. 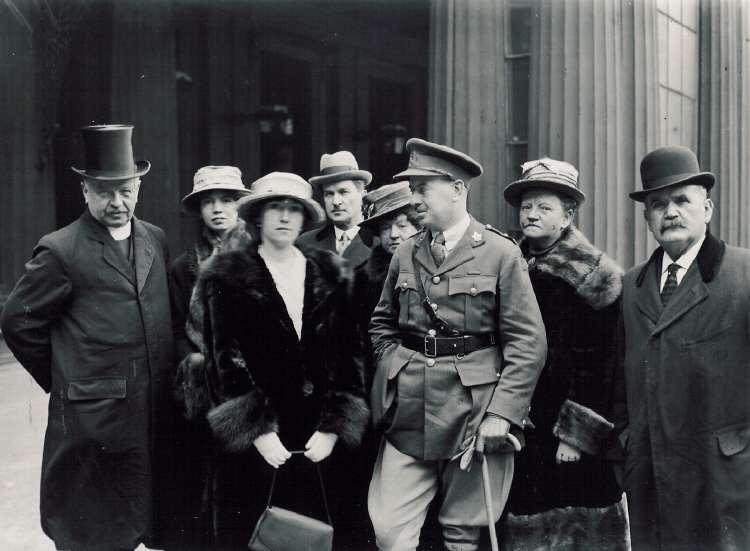 Mitchell’s service in both world wars has been commemorated in a variety of locations. In Manitoba, Coulson Mitchell Lake was named in his honour. In Montréal, a street and a branch of the Royal Canadian Legion bear his name. The main building of the Canadian Forces School of Military Engineering at the Canadian Army Base in Gagetown, New Brunswick, also carries his name. Mitchell passed away at his home in Montréal on November 17, 1978. Library and Archives Canada holds the digitized service file of Captain Coulson Norman Mitchell. 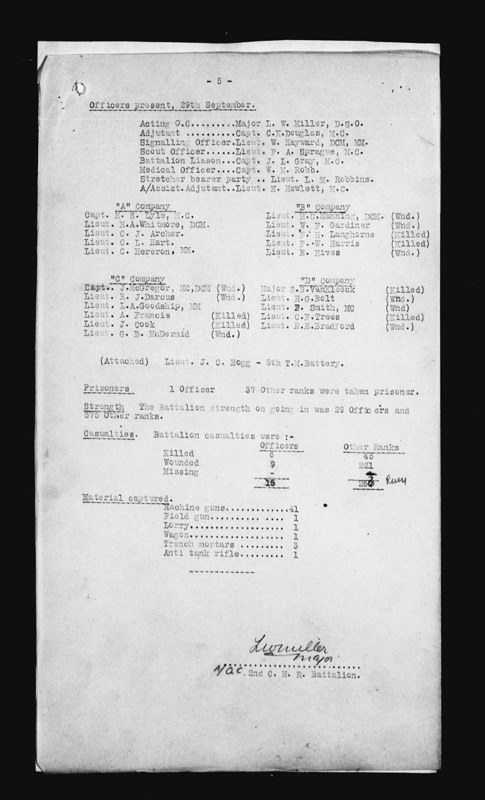 Transcribe war diaries or tag pictures, and give history a hand! 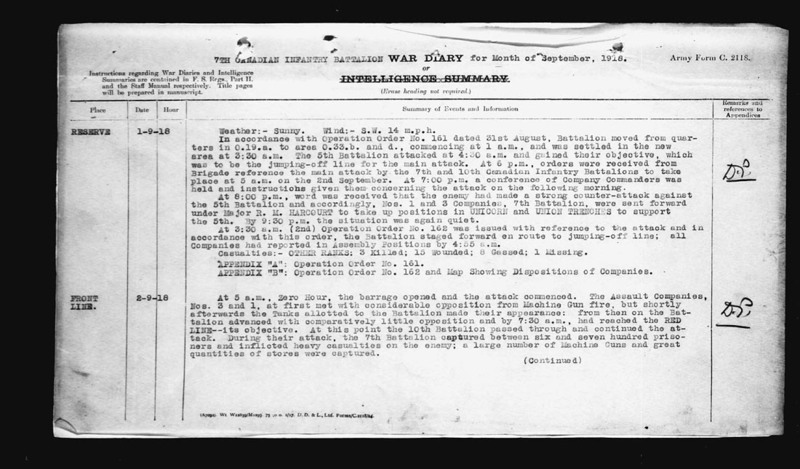 The War Diaries of the Canadian Engineers are open for you to transcribe, tag, translate and describe their contents. Every addition to a record becomes new metadata, searchable within 24 hours, helping Library and Archives Canada’s records become more “discoverable” day after day. Visit the blog article explaining how you can give a hand to history! Ashley Dunk is a project assistant in the Online Content Division of the Public Services Branch at Library and Archives Canada. 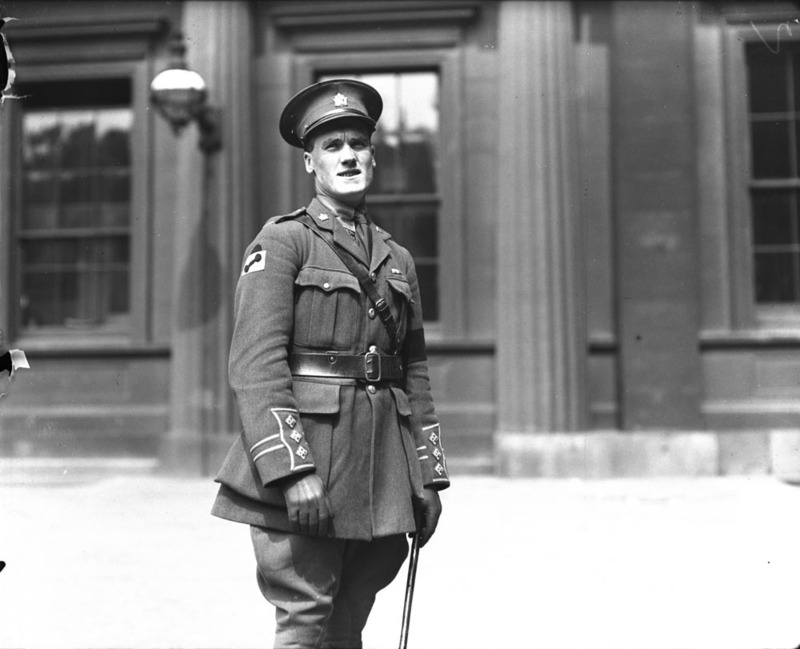 In Library and Archives Canada’s Victoria Cross blog series, we profile Canada’s Victoria Cross recipients on the 100th anniversary of the day they performed heroically in battle, for which they were awarded the Victoria Cross. 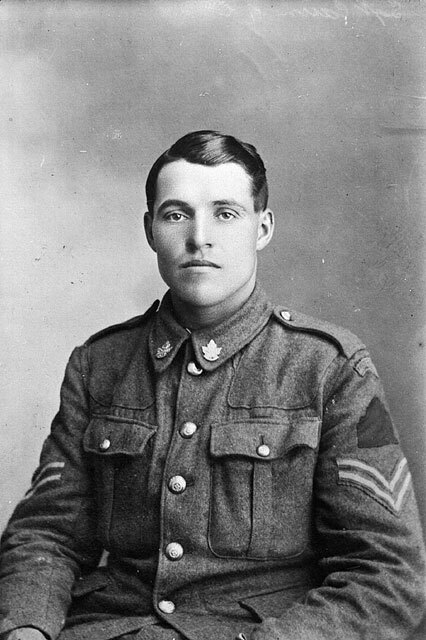 Today, we remember Sergeant William Merrifield and his gallant actions near Abancourt, France, on October 1, 1918. Born in Brentwood, Essex, England, on October 9, 1890, Merrifield was a firefighter before the outbreak of the First World War. He enlisted on September 23, 1914, at Valcartier, Quebec, joining the 2nd Battalion (Canadian Mounted Rifles) of the Canadian Expeditionary Force. In 1917, he joined the 4th Canadian Infantry Battalion. 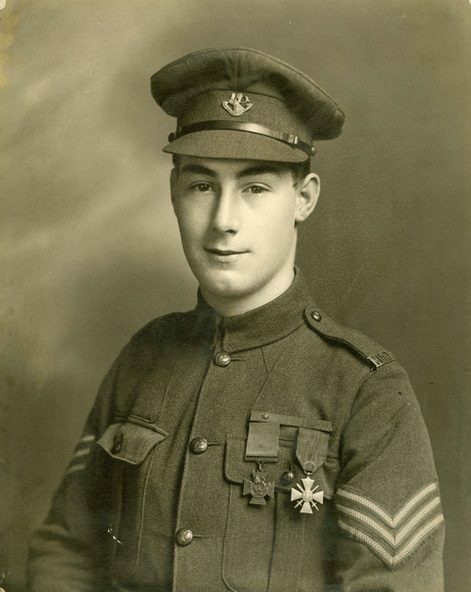 For his bravery in November 1917 during the Battle of Passchendaele, Merrifield received the Military Medal. As September 1918 drew to a close, the Battle of Canal du Nord in France was also near its end. 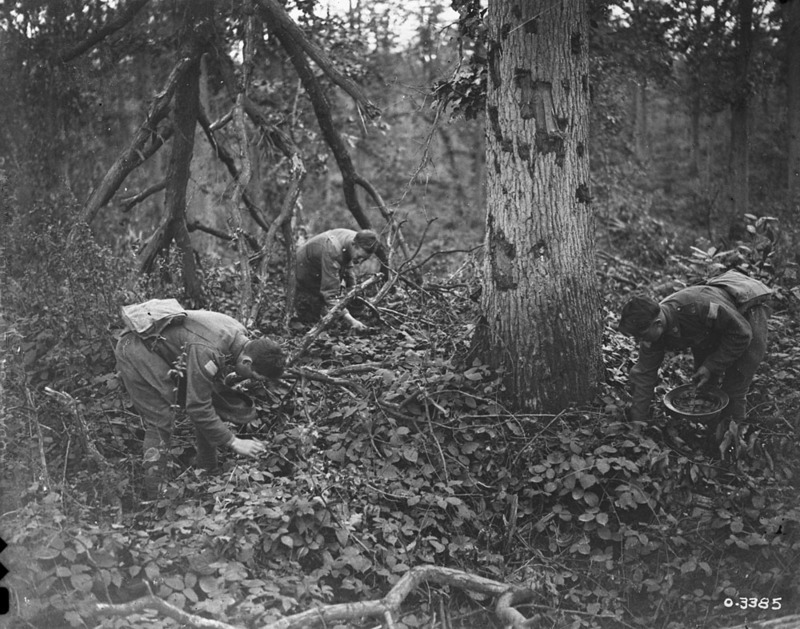 The Canadians stationed around the battlefield were engaged in regular patrols and reconnaissance missions. 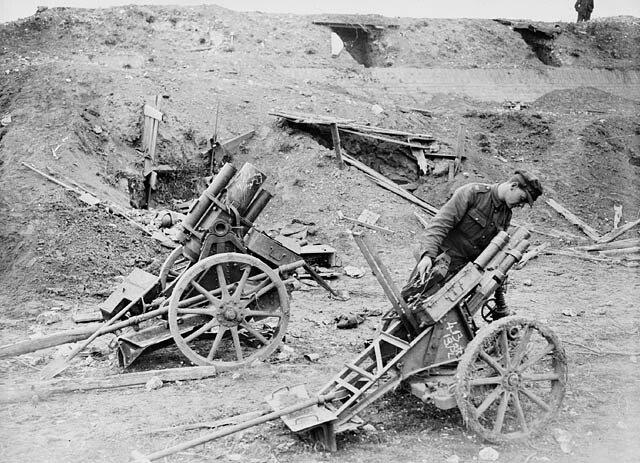 Allied artillery, including 6-inch guns and 60-pounders, fired continually, but the shells often fell short of their targets in the German trenches. In one instance, the Allies accidentally shelled and destroyed one of their own Lewis guns and caused casualties among their own soldiers. 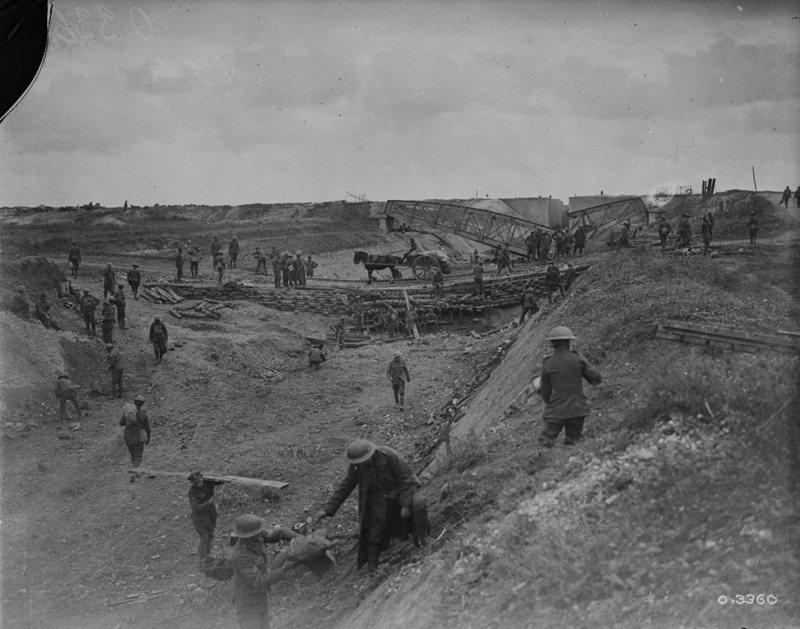 The Germans stubbornly defended their trenches, making the Canadians’ objective of breaking through the lines very difficult. 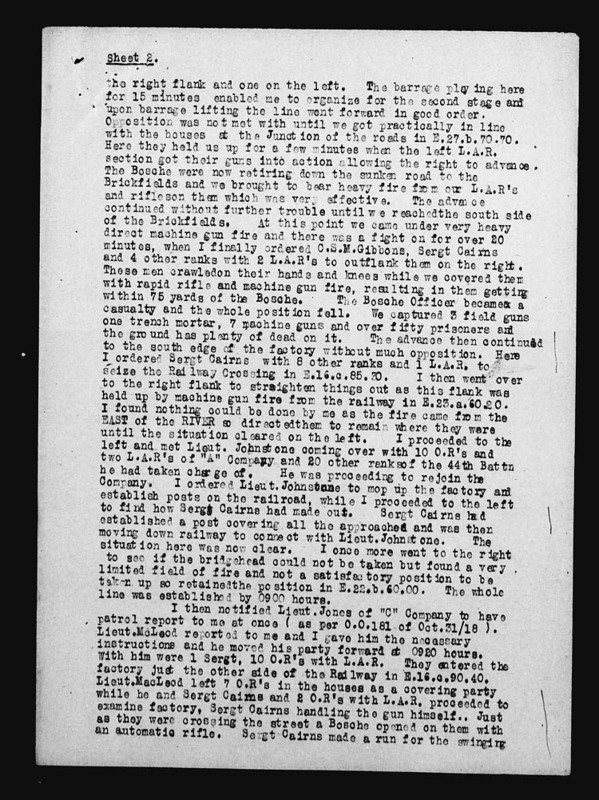 On October 1, 1918, near Abancourt, Merrifield and his men were under fire from two enemy machine-gun posts. Unable to advance further because of the German guns, Merrifield decided to attack both posts single-handedly to eliminate them. Dashing from shell hole to shell hole, he killed the enemy soldiers in the first post and sustained wounds during the assault. In spite of his injuries, he pressed on to the second post, killing its occupants with a hand grenade. He remained in battle and continued to lead his platoon until he was severely wounded. Merrifield survived the remainder of the war and was discharged on April 24, 1919, in general demobilization. He moved to Sault Ste. Marie, Ontario. He died in Toronto on August 8, 1943. A public elementary school in Sault Ste. Marie was named after Merrifield; William Merrifield V.C. Public School in the Algoma District School Board was open from 1946 until June 2015. And Merrifield Outdoor Rink is located at the corner of Henrietta Avenue and Patrick Street in Sault Ste. Marie. As well, the 56th Field Artillery Regiment in Brantford, Ontario, dedicated its armoury (Sergeant William Merrifield VC Armoury) to his memory. 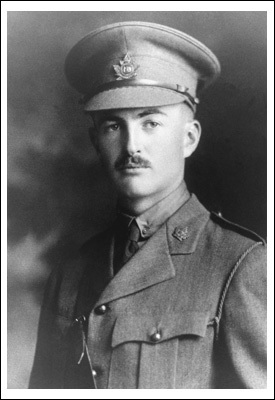 Merrifield’s Victoria Cross was donated to the Canadian War Museum in Ottawa. 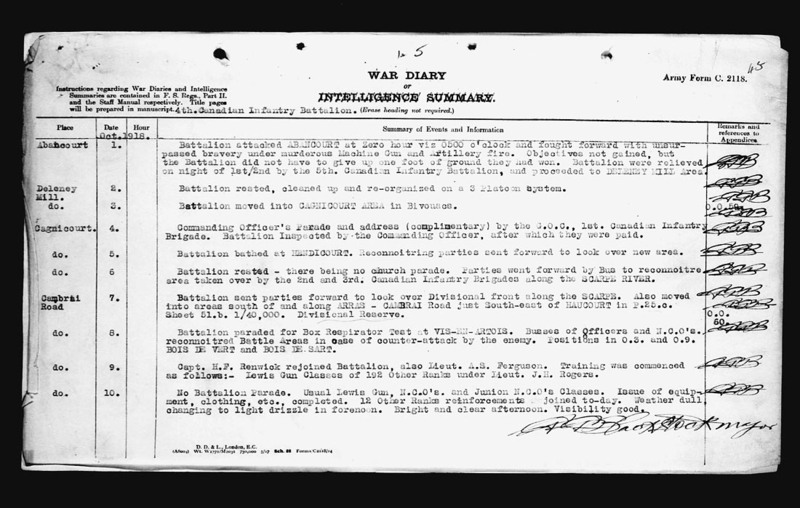 Library and Archives Canada holds the digitized service file of Sergeant William Merrifield. Want to experience life during a time of war? 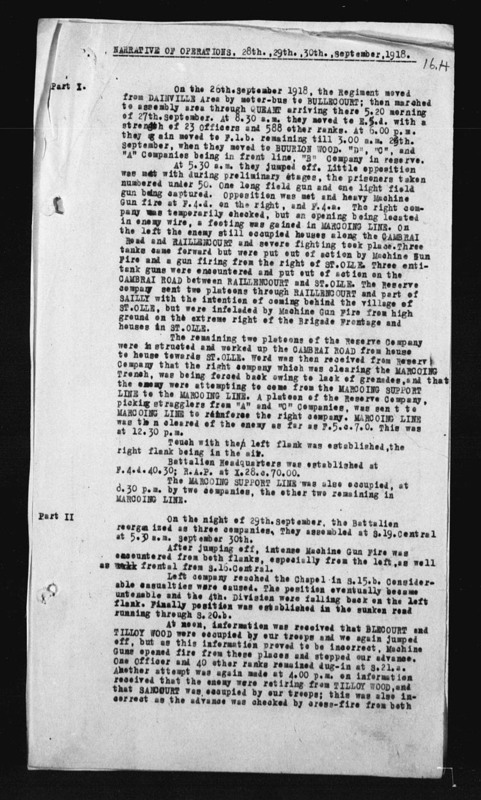 The War Diaries of the 4th Canadian Infantry Battalion are open for you to transcribe, tag, translate and describe their contents. Every addition to a record becomes new metadata, searchable within 24 hours, helping Library and Archives Canada’s records become more “discoverable” day after day. Visit the blog article explaining how you can give a hand to history! In Library and Archives Canada’s Victoria Cross blog series, we profile Canada’s Victoria Cross recipients on the 100th anniversary of the day they performed heroically in battle, for which they were awarded the Victoria Cross. 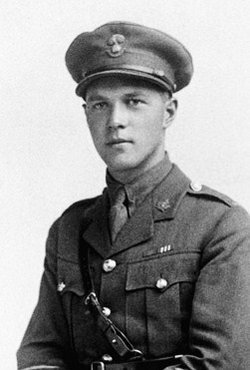 Today, we remember Lieutenant Samuel Lewis Honey and his bravery during the Bourlon Wood operations between September 27 and September 30, 1918. Born in Conn, Ontario, on February 9, 1894, Samuel Lewis Honey was a schoolteacher when he enlisted as a private on January 22, 1915, joining the 34th Battalion of the Canadian Expeditionary Force. He was a decorated and accomplished soldier, receiving the Distinguished Conduct Medal and the Military Medal, and was later commissioned as an officer on July 2, 1917. In autumn 1918, he was serving in France as a lieutenant in the 78th Infantry Battalion. On September 27, 1918, Honey was fighting alongside thousands of Canadian soldiers under heavy machine-gun fire from the German lines at Bourlon Wood. 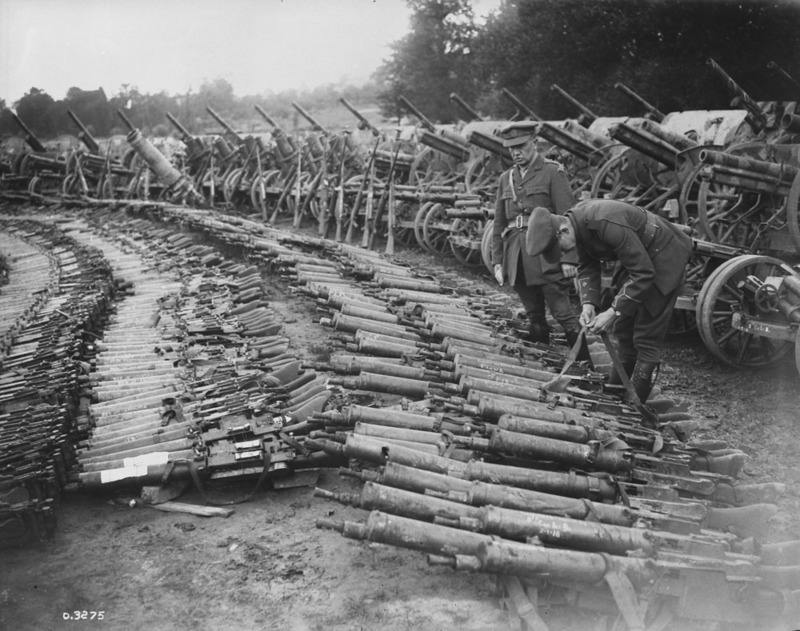 The operation to reach across the Canal du Nord with the ultimate objective of capturing Bourlon Wood and Village was vital for opening the road leading to Cambrai. 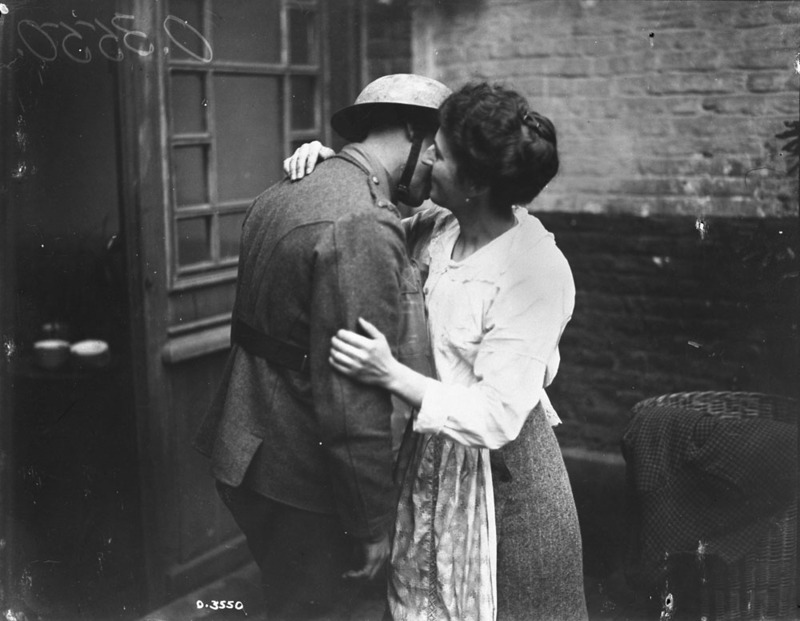 When the commander and officers in his company became casualties to the unrelenting German attacks, Honey took charge. He commanded and reorganized the company and continued with the advance. Lieutenant Samuel Lewis Honey, undated. Source: National Defence and the Canadian Forces. 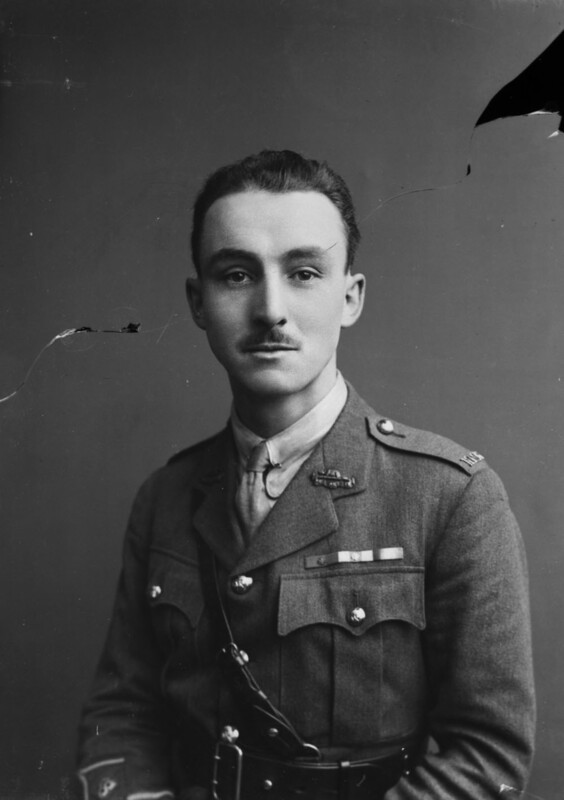 Under his leadership, the objective of capturing Bourlon Wood was achieved; however, it came at the expense of severe casualties. Machine-gun fire was causing significant damage and loss to his company. Honey located the machine-gun nest and rushed it alone, single-handedly capturing the guns and taking 10 prisoners. Following this feat, Honey successfully resisted four enemy counterattacks. He later went out alone in the dark and located an enemy post. Honey and a party of soldiers captured the post and an additional three guns. On the 29th September he led his company against a strong enemy position with great skill and daring and continued in the succeeding days of the battle to display the same high example of valour and self-sacrifice. During this attack, Honey received fatal wounds and died at No. 12 Canadian Field Ambulance on September 30, 1918. Buried at the Queant Communal Cemetery in Pas de Calais, France, he was awarded the Victoria Cross posthumously. His Victoria Cross is displayed at the Canadian War Museum in Ottawa. A plaque is dedicated to Honey in Mount Forest, Ontario. 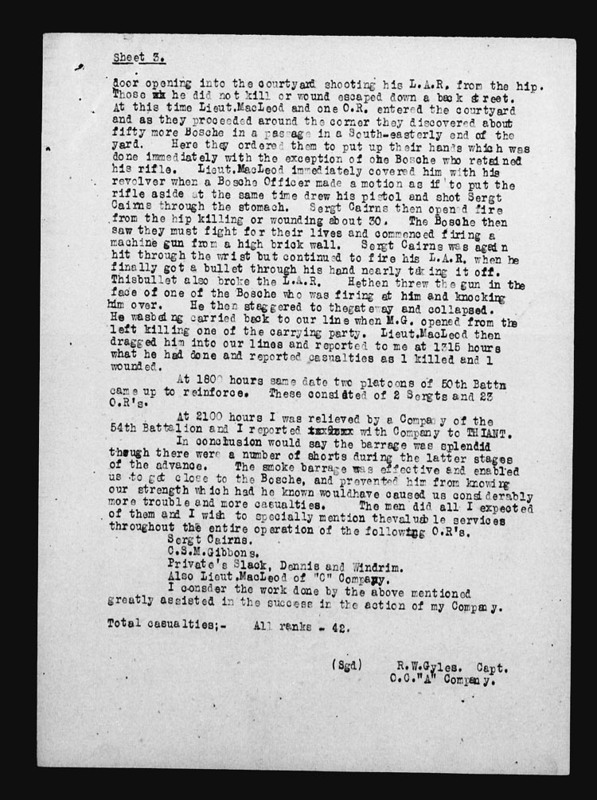 Library and Archives Canada holds the digitized service file of Lieutenant Samuel Lewis Honey. Tag pictures and give a hand to history! The images in this blog post are open for tagging! 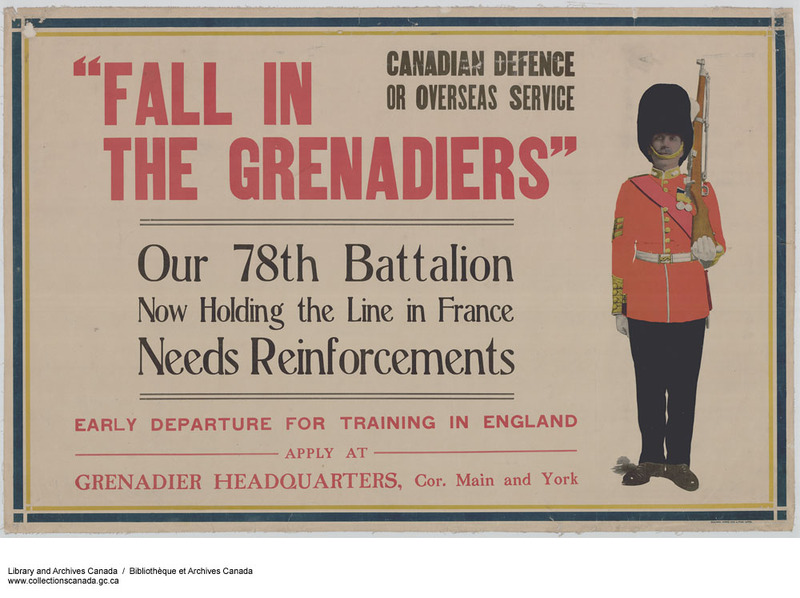 Immerse yourself in the Canadian Expeditionary Force digitized files and transcribe, tag, translate and describe their contents. Every addition to a record becomes new metadata, searchable within 24 hours, helping Library and Archives Canada’s records become more “discoverable” day after day. Read the blog article explaining how you can give a hand to history! In Library and Archives Canada’s Victoria Cross blog series, we profile Canada’s Victoria Cross recipients on the 100th anniversary of the day they performed heroically in battle, for which they were awarded the Victoria Cross. Today, we remember Lieutenant Milton Fowler Gregg and his courageous actions during the Battle of Canal du Nord on September 28, 1918. Born on April 10, 1892, in Mountain Dale, Kings County, New Brunswick, Milton Fowler Gregg was a student before enlisting with the Canadian Expeditionary Force on November 5, 1914. 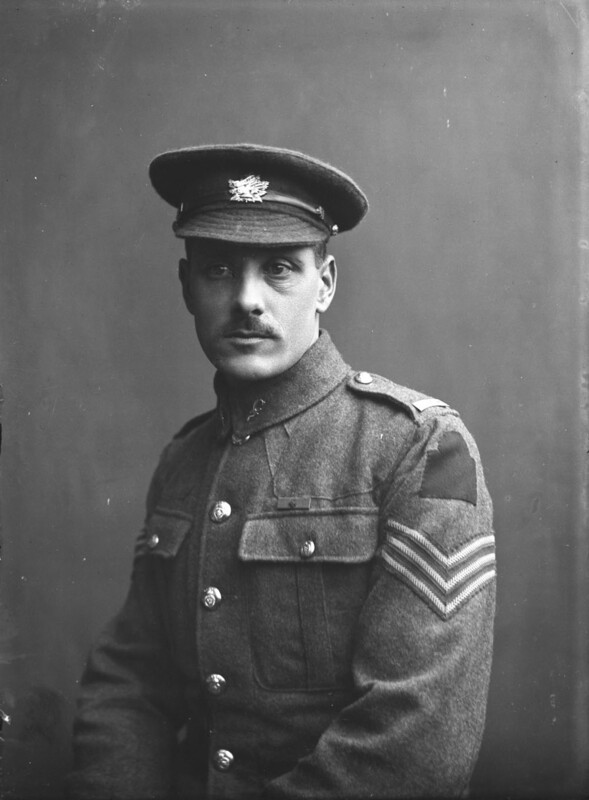 Gregg earned the Military Cross in 1917 and was awarded a bar for the Cross for gallant actions in 1918. 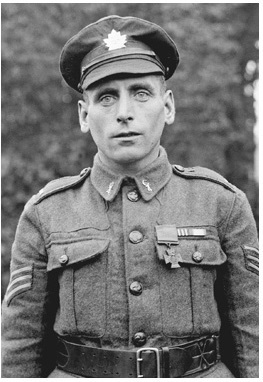 A decorated soldier, Gregg was serving as a Lieutenant with the Royal Canadian Regiment (RCR) in September 1918. From September 28 to September 30, 1918, the RCR was moving with the 3rd Canadian Infantry Division on operations to cross the Canal du Nord, capture Bourlon Wood and Village, and advance to Cambrai, France. With the ultimate objective of opening the road to Cambrai, it was essential for the RCR to advance and gain a foothold. 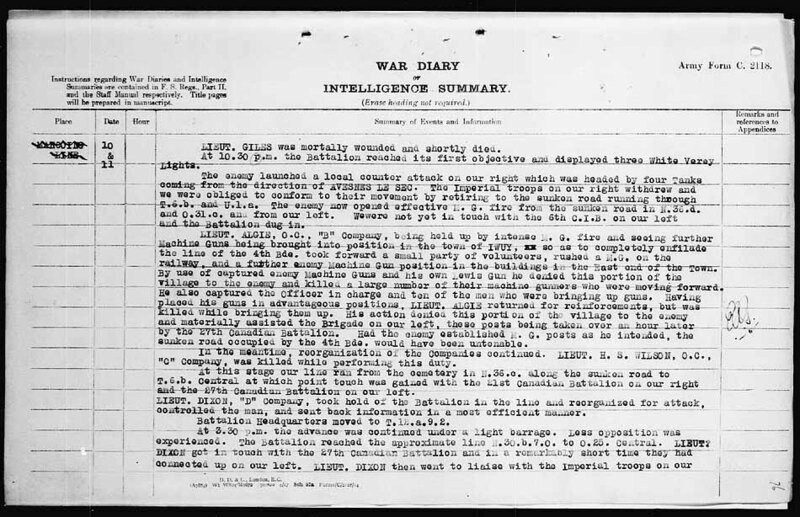 The RCR assault began at 5:40 a.m. and faced little opposition until it was met with heavy machine-gun fire from enemy soldiers positioned in nearby buildings. Three tanks were brought up as reinforcements; however, the persistent machine guns and anti-tank guns put them out of action. During the Battle of Canal du Nord, Gregg performed heroically, as in previous operations. On September 28, 1918, both flanks of the brigade were held up by heavy enemy fire, pinned down by rapid machine-gun bursts, and trapped by twisted, uncut barbed wire. Crawling forward alone, Gregg eventually found a small gap in the wire. He led his men through the hole and forced his way into the enemy trench. 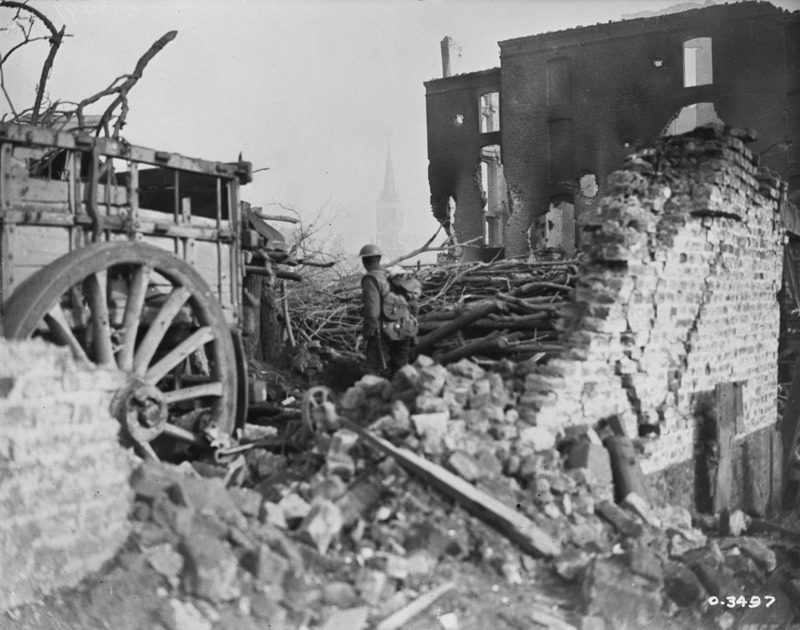 A heavy counterattack from German soldiers saw increasing RCR casualties, and dwindling bomb supplies, leaving the brigade vulnerable. Gregg, who had been wounded during his forward push, retreated in order to retrieve additional grenades. He rejoined his party with much-needed supplies but suffered a second wound in the effort. Despite his injuries, he reorganized the men and led them against the enemy trenches. Under his leadership, they cleared the enemy trench and gained a footing in the Marcoing Line. He personally killed or wounded 11 of the enemy and took 25 prisoners, in addition to 12 machine guns captured in this trench. Remaining with his company in spite of wounds, he again on the 30th September led his men in attack until severely wounded. The outstanding valour of this officer saved many casualties and enabled the advance to continue. Gregg survived the remainder of the war, held a variety of political positions, and served overseas during the Second World War. He passed away on March 13, 1978, at the age of 85. His Victoria Cross is on display at the Royal Canadian Regiment Museum in London, Ontario. 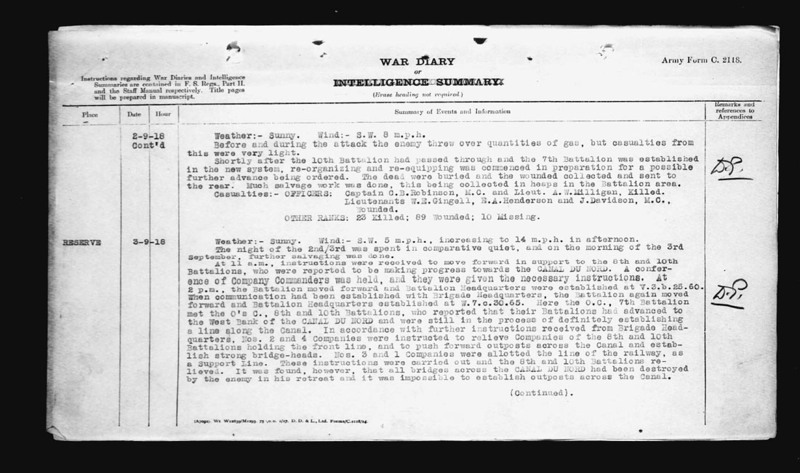 Library and Archives Canada holds the digitized service file of Lieutenant Milton Fowler Gregg. 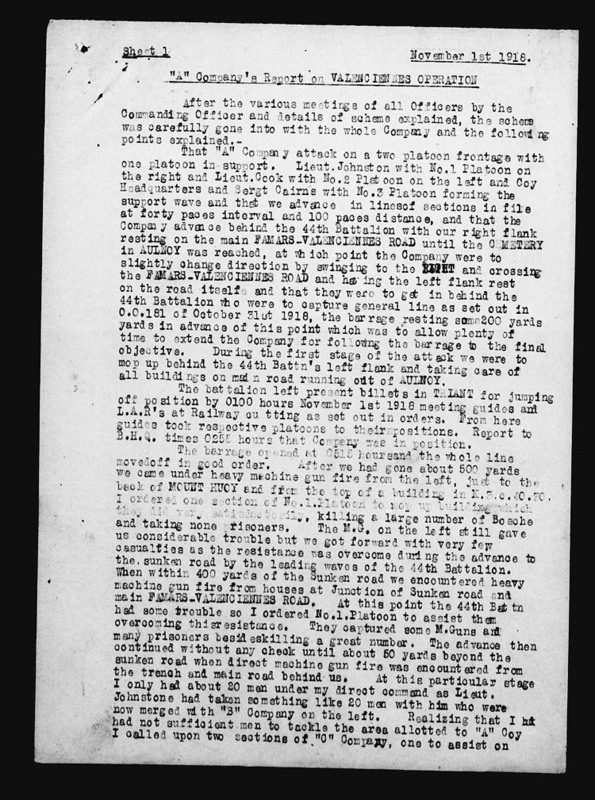 The War Diaries of the Royal Canadian Regiment are open for you to transcribe, tag, translate and describe their contents. Every addition to a record becomes new metadata, searchable within 24 hours, helping Library and Archives Canada’s records become more “discoverable” day after day. Read the blog article explaining how you can give a hand to history!